This is the cutest idea! I featured you today @ crazydomestic.com. forgot to mention we have "I was featured" buttons, feel free to grab one! I LOVE the snowman! How cute! I really want to do this, but I have a chrome fridge! Darn! This is a great idea. I found your blog through THE IDEA ROOM. It looks like you've just begun blogging. Have fun and enjoy :) My blog is a modge podge of stuff. You are welcome to visit and follow. Ok, that is too cute! I'd do it here, but we have a stainless steel fridge, lol! Darling idea! My daughter would love this! 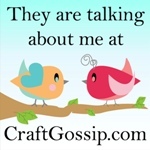 Found your photo and link on CraftGossip. I posted the photo and your blog link on my blog, hoping you will get more followers. Toooo cute. Absolutely darling! I am definately going to do this to my fridge this year! Thanks for the idea! Cute! My kids are going to LOVE this...I know what we're doing this afternoon! That is too darn cute... I might have to do all the fridges at the lodge I own that way for a nice Christmas surprise for my guests. THIS is darling!!! How fun and creative you are!! I copied you and used foam sheets and magnets on the back... it is kind of an emoticon for how the family is feeling, sometimes I come in to big frowns, or worried grins. :) Thanks for sharing your idea. LOVE IT! Found your idea on pinterest Only 191 days until Christmas LOL! So how do you make the snowman? @ Anonymous, I just cut the shapes out of paper I had at home. The scarf was wrapping paper and the rest was scrapbook paper. Hope that helps. I have tried to leave comments on several of your blogs to thank you for stopping by, but can't seem to get it done. It keeps telling me I don't have permission to be there! I don't know what the problem is, but thanks for stopping by, and please know I stopped by all of your blogs too! It did it to mine just now too and I know I have permission to be here!!! I did this on my stainless steel refrigerator and it is still cute. Thank you so much for the idea!!! Found this on pinterest a few days ago, and I'm doing it tonight. What a fab idea! Thank you!! I found this on Pinterest and I did it today. Thanksfor the great idea!!! I am SO doing that!! I discovered this site exceptionally enlightening & successful. Thanks much for this post.You know, you oblige a legitimate storage room framework to keep up your arrangement of wines. By reading Wine Cooler Reviews you can know a lot about this. The Best LG Refrigerator Service Center in Hyderabad.contact:040-0506611,60506622. In twin cities we are the best service providers for washing machines because we have well experienced professionals in our branch. Here we got a awesome technical staff our technicians will solve all issues of washing machines without any delaying the consumers complaint at a low cost of price rs.350/- with 3 months of warranty. Fridge repair centre in Hyderabad is the best for twin cities. We are providing a service for all types of home electrical gadgets. Are you suffering with the improper working of home fridge repair here we provide the fridge repair centre in hyderabad service in all home appliance digital electronic service is the best for your home gadgets. The problem may be the defrost timer, defrost heater. We offer our service with low cost and high quality products. If you hear a clicking sound for the back of the fridge problem in the fridge is over heated. fridge repair centre in Hyderabad at a low cost of price of rs.350/- with 3 months of warranty. Daikin air conditioner service center in Hyderabad the problems of air conditioner is ac does not cool the room. Air conditioner does not operate. Here we repair all the air conditioner products not only daikin air conditioner service center in hyderabad daikin all products are repair. A clicking sound is produced air conditioner are some many types like split , and multi split air conditioner are there . Digital electronic service is the best for all you air conditioner products. daikin air conditioner service center in Hyderabad at a low cost of price of rs.650/- with 3 months of warranty. Controls individual rooms. Haier microwave oven is a kitchen appliance and microwave is not working. Here we solve all the microwave oven problems. Digital electronic service is the best for the entire home appliance. High voltage haier microwave oven service center in hyderabad capacitor and lamp has not working. You can make a cake in the microwave in just a couple minutes. You can toust nuts in microwave. And all food purpose we can use microwave only. Our service will available at 24 hours. haier microwave oven service center in Hyderabad at a low cost of price of rs.350/- with 3 months of warranty. Refrigerator technicians are available here contact 9177744460, 9177700012 for door delivery with our experienced and qualified technicians having more than 6 years of experience in home appliance services at Hyderabad Telangana provides services for all brands like Samsung, LG, whirlpool, onida, Godrej, IFB etc. we specialized in repairing all kinds of refrigerators like single door, double door and triple door refrigerators for all brands. For repair services or installation assistances with any brand of Refrigerator contact SAMSUNG Refrigerator Repair Hyderabad Service Center Secunderabadwe provide you with expert support you do not wish to bother about that. Call us today for booking our services. Microwave oven repair center can helps customers in repairing all their home appliances at their residence. Call IFB Microwave Oven Repair Hyderabad Service Center Secunderabadwhen you needed. Here is our service center helpdesk numbers 9177799956, 9177700044 when you call or message us, we will schedule a specific time to come to your home and repair your microwave oven. Book an appointment now by dropping message. Visit our site for more information. The service charge for repairing and installation of any brand of microwave oven is 350/- at a warranty of 90 days. We have very good service center Electrolux microwave oven service center in Hyderabadfor repairing microwave ovens across different areas of Hyderabad and Secunderabad Telangana. We have best qualified technicians having well experience in providing services for all companies of microwave ovens to resolve the problem of your microwave oven at the earliest. We provide services at any season and our technicians will reach your home location very fast to solve the problems permanently. You just make a call to our customer care 9177700065, 9177799956 we will charge less for repairing microwave oven is 350/- and will give warranty for the service is 90 days. The refrigerator is common using for home, hospitals, office continuously using process repairs occurred stop running. Are you searching best services center? Our refrigerator repair center fridge repair centre in hyderabad all brands of refrigerator repairs and also service all brands of home appliances fridge repair centre in hyderabad services for at low cost across the city fridge repair centre in Hyderabad We are in the market since over 15 years and are having many clients to our amazing best home appliance services. Best service centre with qualified specialized staff to ascend to the necessity of our clients in today's requesting market. We are having the best Air conditioner Service center whereas Dakin Company is best to buy in the Homemade daikin air conditioner service center in hyderabad at room temperature the air conditioner is standard. daikin air conditioner service center in hyderabad Our Service center is available 24*7 at Hyderabad and Secunderabad. In the Air conditioner the outdoor is heated and still getting outside temperature daikin air conditioner service center in Hyderabad Our experts are trained and experience persons understand customer quires and analysis issues, repairs issues give best services for ac with door step. Services charge for ac is 650/- maintained up to 3 months and extra charges for new spare parts replacement. The Microwave Oven is the best product to provide the service for customers at doorsteps the technicians are well haier microwave oven service center in hyderabad experienced in all types of products of Samsung brand. Our Service center is available 24*7 at Hyderabad. Haier microwave oven service center in Hyderabad After services microwave oven run long time. Services charge for Microwave is 350/- maintained up to three months. haier microwave oven service center in hyderabad Extra services charges for spare parts replacement. The after-deals service of a specific brand confers not may the stamp. Every one of the notable points of interest boot is discovered on ratings. We are provide with regards to repair and service and typical issues we are experienced with technicians for all brands haier microwave oven repair center in hyderabad in the house there comes a point in time when there is unavoidable trouble. It is quite hard to distinguish a problem if you are clueless on the symptom of the problem.we provide at low cost 350/- and 3 months warranty. We provide benefit alla finished hyderabad and secunderabad area.We are best whirlpool home machine benefit LG AC Repair Hyderabad Service Center Secunderabad haier air conditioner repair center provides repair services all available.we believe in having a responsibility to provide not only service in repairing home appliance,but providing you with the environment in power and cost centers we provide at low cost 650/- and 3 months warranty. home appliance but providing you with the environment in power and cost centers of the microorganism electrolux refrigerator repair center in hyderabad we provide at low cost 350/- and 3 months warranty In it’s this sensing that detects the temperature inside the electric refrigerator. The refrigerator is very common need for every home nowadays. At this busy schedulle of time and if any problem occurs in your refrigerators and you are looking for the service centre. A refrigerator repair centre in hyderabad of service centre offering services and repairing for refrigerators but many people prefer being refrigerator repair centre in hyderabad skilled professionals trained to handle any kind of Refrigerator Repair in Hyderabad issues, the service technicians are well-placed to deal with a variety of Refrigerator problems we will provide door step also you can find our service center in your nearby Hyderabad refrigerator repair centre in hyderabad at a low cost of price of rs.350/-with 3 months of warranty. We are the well known service center in repairing all kinds of home appliances and our service persons are well experienced in repairing IFB Washing Machine Repair Hyderabad Service Center Secunderabad we have practical experience in service and repair. At our technicians are well knowledged and communicative. We give the offer at low cost rs.350/- with 3 months IFB Washing Machine Repair Hyderabad Service Center Secunderabad warranty. Our service center provides all brands of services at warranty prices with 100% customer satisfaction. Our services center technicians’ team are well trained and experience persons easy to understand customer quires and cheek the washing machine find out damaged area. Hitachi air conditioner repair center in Hyderabad The air conditioner is the best machine to cool your living area and condition choosing the best air circulation and cooling system may not be clear. hitachi air conditioner repair center in hyderabad Choosing which one is best for you is so embarrassing. Basically, depending on the area you have Hitachi air conditioner repair center in Hyderabad left and the space you used for the cooling object are the airflow guidance segments and cooling systems. Haier Company offering various models of an air conditioner on the market and the association has the best. Original spare parts replaced with old or damaged spare parts with extra charges. Services charge for ac is 650/- maintained three months. Are you facing problems with your microwave oven system and are you looking for microwave service center? If so yes approach or call IFB Microwave Oven Repair Hyderabad Service Center Secunderabad a leading expert in home appliance repairs and services, our services are well liked by all. We handle every client request at utmost priority. Hire us to fix your microwave oven and other home appliances and we are ready to handle any kind of issues we assure your quality in our service. Is your microwave oven is not functioning well due to some kind of heating issue or any other kind of issues? Then contact Electrolux microwave oven service center in Hyderabad by visiting our site, you can drop message or call us for having quick home services on the same day we will sent an technician at your given home location he analyze the issue and do service, if there is any damaged parts would be there he can replace with new spare parts if needed to prolong the life of the appliance. He will charge 350/- for repairing any brand of microwave oven with the warranty of 90 days, no hidden charges applicable. Our service center washing machine repairmen are committed to maintaining the manufacturer's high quality of engineering standards.We electrolux washing machine service center in hyderabad are dedicated to providing quality service. We give offer at low cost of price rs.350/- with 3 months. We refrigerator service center in hyderabad charge a very reasonable price for all our Repair and services.we give services at low cost of price rs.350/- with 3 months warrantee. Our Expert Service and repair technicians have Knowledge of Refrigerator, in field experience. We SAMSUNG Washing Machine Repair Hyderabad Service Center Secunderabad are samsung service center we are having lacks of satisfied customers in hyderabad. we give services at low cost of price rs.350/- with 3 months warrantee.we are located area wise service center in hyderabad, in all ares in hyderabad we are providing doorstep service. The refrigerator is essential and important to store food items and drink cool water. Continuous running process troubling happens to approach the refrigerator experts. Haier refrigerator services center repairs any brand of refrigerator services from across the Hyderabad. haier refrigerator repair center in hyderabad Our technicians are experienced persons easy to understand issues and rectify issues give reliable services in doorstep with services charge 350/- warranty for 90 days. We are offering all brands of home appliances services at low cost. AC is an essential and important appliance for nowadays temperature. continuously using process troubles happen running process. You can contact ac experts. Voltas ac services center repairs any brand of ac services from across the Hyderabad. Voltas AC Repair Hyderabad Service Center Secunderabad Our experts are qualified and experienced persons easy to rectify any issues of ac give reliable services on the doorstep. Services charge for ac is 650/- warranty for 90 days. Offering all brands of home appliances services with low cost fitted your budget. Technicians easy to arrange any damaged spare parts replaced with new spare parts. The refrigerator is daily essential for to drink cool water and store food items for a long time day and night continuously using process repairs are happen, You can contact the refrigerator expert. LG Refrigerator services center repairs any brand of refrigerator services from across the Hyderabad. LG Refrigerator Repair Hyderabad Service Center Secunderabad Our technicians are qualified and experienced persons easy to analysis issues and rectify issues give reliable services for the doorstep with services charge 350/- warranty for 90 days. Technicians easy to arrange any damaged spare parts replaced with new spare parts. Refrigerator repair centre in Hyderabad here we introduce digital electronic service center we repair all types of home appliances like washing machine, fridge, heater, air conditioner, Our motto is to refrigerator repair centre in hyderabad provide best solutions to our customers with affordable service charges. You can now book a professional refrigerator repair centre in hyderabad either for service and repair within minutes from home. A low cost of price of rs.350/-with 3 months of warranty. We are avalaible at any time 24*7. Compressor failure and making noise too much, Refrigerator Water dispenser not working, fridge is not defrosting, Freezer and ice maker not worked etc. IFB Washing Machine Repair Hyderabad Service Center Secunderabad a repair well-positioned to fix your Washing Machine problem area, with professional competence and ease must maintain IFB Washing Machine Repair Hyderabad Service Center Secunderabad a good stock of genuine and quality spare parts that are specific & works for Washing Machines. IFB Washing Machine Repair Hyderabad Service Center Secunderabad We provide home services also. Our main aim is the good service to the customers. Certified technicians and give us opportunity to provide services in your home. Providing original spare parts as a replacement for the old or damaged spare parts our main goal. hitachi air conditioner repair center in hyderabad we repair all types of home appliance. Air coolers for individual along use with the commercial refrigerator products,cold storage. Air conditioner is manyhitachi air conditioner repair center in hyderabad types inverter air conditioner, split air conditioner, window air conditioner, portable air conditioner etc. hitachi air conditioner repair center in hyderabad Our service center will provide any time and season for providing a good service to the customers. A clicking sound is produced in your air conditioner and doesn’t cool or heat the room. Our guys will without any issue will rise once again and there is no problem will be faced by the consumers. Haier AC Service Center in Hyderabad repairs Acs with reasonable charges. We are a multi-brand service center in Hyderabad &Secunderabad. Service Centre in chennai provide services for all types services and repairing for all types of Refrigerator products for all over in Chennai.Ou Refrigerator Service Centre in chennai is fully Refrigerator Service centre.We service and repair your Refrigerator at Afforable price.Refrigerator Service Center in Chennai. The washing machine is a mandatory home appliance in every home. The washing machine can be manufactured in different sizes by various brands available in the market. So as time passed away the problems haier washing machine repair center in hyderabad are also common for every electronic haier washing machine repair center in hyderabad gadget. Digital electronic provide services for any type of Haier Washing Machine Service Center Hyderabad with the professional experts at your doorstep at an affordable price 350/- with the warranty of 3 months. If do you have any requirement of washing machine services at Hyderabad kindly contact us to get our service. We will replace all failure parts with new genuine branded parts. A microwave oven is most important in today home appliance at these busy days to cook and eat the food. It saves lots of time in our daily life. If it stops working and giving trouble to you then contact us Microwave Oven Service Center Hyderabad microwave oven repair center in Hyderabad Telangana. Microwave Oven Service Center Hyderabad If you are searching the best service center here we provide the service to the home gadgets our technician will come to your home and provide the service in front of you only. Give services for your home appliances which are under in repair with the affordable service charge 350/- and a warranty of 3 months. Are you searching for washing machine service center? Users can now get the best of washing machine features and lowest price with this washing machines price list. Our technicians are well talented Whirlpool Washing Machine Service Center in Hyderabad and experienced in this field. Buyers have plenty of options to choose from when it comes to buying a washing Whirlpool Washing Machine Service Center in Hyderabad machine in India. Washing machines range from and semi-automatic washing machines are an affordable variety that comes with two tubs, one for washing and other for drying. Once the wash cycle is complete, the washed clothes need to be transferred to the drying tube for the spin cycle. We provide Whirlpool Microwave Oven Service Center for obtaining your gadgets settled at the most effective rates Whirlpool Microwave Oven Repair Hyderabad Service Center Secunderabad We never frustrate you and can offer you associate degree administration which will meet past your wishes. Thus do not rethink and basically choose Whirlpool Microwave Oven Service Center for the most effective microwave broilers administrations at commendable rates repairing home appliance but providing you with the environment in power and cost centers we provide at low cost 350/- and 3 months warranty. We provide you need your clothes washer to continue running easily for a considerable length of time to come it is savvy to Haier washing machine service center in Hyderabad utilize these clothes washer upkeep tips so you can get the most out of your apparatus. Washers are subjected to various things that can make it wear out if not counteracted or kept an eye on each three to a half year. We provide Haier Washing Machine service repair center provides repair services all available we believe in having a responsibility to provide not only service in repairing a home appliance but providing you with the environment in power and cost centers we provide at low cost 350/- and 3 months warranty. We provide Microwave oven service repair center provides repair services all available, we believe in having responsibility to provide not only service in repairing home appliance, but providing you with the environment in power and cost centers IFB Microwave Oven Service Center in Hyderabad we provide at low cost 350/- and 3 months warranty we hope to exceed your expectations and keeping your operation running smoothly. IFB Microwave Oven Service Center in Hyderabad is specialized in Repair & Service of Electrolux Microwave Oven products across the city. Electrolux Microwave Oven Authorized Service Centre has well trained and highly talented customer service executives to handle the customer queries. We are provide air conditioner repair and service home appliance and it will save time and water if you want to get any Bluestar air conditioner repair center in Hyderabadservice or repair for our technicians are well talented and they are easy to solve any issues of air conditioner our service technicians are well trained and knowledgeable in the air conditioner service.Right here square measure multiple repairing home appliance. We are provide with regards to repair and service and typical issues we are experienced with technicians for all brands Godrej Microwave Oven Repair Center in Hyderabad of oven we provide at low cost 350/- and 3 months warranty whether the ventilation system is little or extensive, shoddy or costly the beyond any doubt thing is it will constantly. We are best LG AC Repair Hyderabad providers benefitfocus in hyderabad types of brands LG AC repair in Hyderabad We give services at low cost of price rs.650/- with 3 months. Our technicians are well trained and high communivative. We are having 100% best services. Providing AC’s repairs & Services at customer doorstep and we are providing genuine services and original company parts to our customers. One of the most important things that you have to do at your home service is preventative maintenance for your Refrigerator. When it was stop working immediate service is needed right away when it required is the next step of process. It is not always easy to do though you need a professional help for that contact Electrolux refrigerator service center in Hyderabad our technicians can replace the parts that no longer works. Electrolux refrigerator service center in Hyderabad Making repairs are usually necessary from time to time to maintain the system integrity well call us today for having services for your refrigerator at your home location with the service charge 350/- for repairing refrigerator of any brand we will give warranty 3 months. Air conditioner problems are usually occurs when the appliance becomes old due to internal broke down of some parts whatever it may be. If you require any type of air conditioner service or repair problems simply call to these numbers 9177799956, 9177744460 we will be available at any time for customer service or visit our website Bluestar air conditioner repair center in Hyderabad and drop your address details like your name address location and your convenient timings Bluestar air conditioner repair center in Hyderabad so that we will send our service engineers to your given address location regarding servicing they can sort out your issues within the same day with the service charge 650/- at a warranty of 3 months. Microwave ovens are seems like simple and reliable appliances it needs to be maintained regularly to avoid some serious problems in future. Any microwave oven that gets old after some years like 10 to 15 years should probably be checked. Microwave Oven Repair Hyderabad Service Center Secunderabad Any microwave oven of that age should just be replaced with new genuine parts to prolong the life of your appliance little more. Microwave Oven Repair Hyderabad Service Center Secunderabad Just in case you are the one to avoid these problems regular checkup and maintenance is needed contact to these service center by visiting our website link drop your address details we will get back to you. LG Microwave Oven Service Center in Hyderabad our Service center professionals can easily solve any issues of microwave oven, and they known all parts of microwave oven end to end they can if you have LG Microwave Oven Service Center in Hyderabad change spare LG Microwave Oven Service Center in Hyderabad parts they can change with less amount of money just 350/- only. haier microwave oven service Hyderabad and Secunderabad in digital service center is the best service center in all over india. We have so many branches are there in nearby you in Hyderabad. Our aim is to customer be feel happy to repair our service. We provide doorstep service also. Are you searching for Whirlpool Microwave Oven Service Center in Hyderabad digital electronic service center is the end –to-end microwave service solution center in Hyderabad we are dealing with all types of Whirlpool Microwave Oven Service Center in Hyderabad popular brands. Our professional microwave technicians Whirlpool Microwave Oven Service Center in Hyderabad are very experienced and talented person are there in our service center. We provide home services for air conditioner, refrigerator, washing machine, microwave etc. Food item is not getting heated properly.oven’s light bulb is not working properly. Washing Machine Service Center Hyderabad Nowadays numbers of Washing Machine models are available in the market. If you have made any repair is Service to the washing machine choose professionals to solve that issues. So that we are providing the best technicians to solving ONIDA washing machine service center in hyderabad any issues of Washing Machine in any area of Hyderabad and Secunderabad and also providing ONIDA washing machine service center in hyderabad doorstep Services. We have so many branches are there in Hyderabad. Our service is the best for the home appliance. We will available at any time you can contact our service center. Our service persons can attend your location in time. AC service center in Hyderabad The process to book a service with them is easy. You can call up the customer care team. Air conditioning running day and night could lead to a problem. If not, you can log in to their website and put in a requisition form. LG Air Conditioner Service Center in Hyderabad The response from the team is quick and efficient. Services for ac is 650/- warranty for 90 days, all brands of home appliances services low cost fitted your budget. Most air conditioners are expensive and it is a good idea to rent them especially if they are to be used only for a short period of time. When renting a new air conditioner one has to consider the type of air conditioner, size and the electricity costs involved. Air Conditioner Service Center in Hyderabad Different brands of air conditioners, suitable for different room sizes and electricity voltage, are available. Rental fees tend to decrease as the time period of rental increases we provide service and repair at low cost 650/- and 3 months warranty. We are provide with regards to repair and service and typical issues we are experienced with technicians for all brands we believe in having a responsibility to Samsung AC Service Center in Hyderabad provide not only service in repairing home appliance,but providing you with the environment in power but providing you with the environment in power and cost centers we provide service and repair at low cost 650/- and 3 months warranty. Hitachi AC Service Center in Hyderabad provides 24/7 repair support. Thank You, Nice Blog Washing Machine Service Center in Hyderabad Contact No.+91-9493725242, 040-66833002. Goserviceszone.in provides Reliable Doorstep Repair Services. 100% Customer Satisfaction and Quality Services. Thank You for providing useful information. Servicecentersinhyderabad.com offers Reliable DoorStep Samsung Home Appliance Repair Services in Hyderabad and Secunderabad.Same day Service with 24*7 Support. Call Us now : 9640036052. We specialize in repairing all kinds of Washing Machines all brands across Hyderabad and Secunderabad. We have company trained repairing staff, who can get into detail analysis of repair. Washing Machine Service Center in Hyderabad. We use genuine parts only. Please call 9885578328. Bosch front load washing machine service center Shollinganallur the best repair service. We Serve the best all brand offering services with affordable charge & best quality.